Sankofa House: A Place of Belonging Community and social support form the heart of W&L's newest theme house. The amenities of the new Sankofa House are any resident’s dream: a sprawling chef’s kitchen, wide windows lavishing light over 5,000 square feet of freshly renovated living space. Just steps away from campus, Sankofa House, one of W&L’s newest theme houses, is more than just a place for folks to hang their hats. 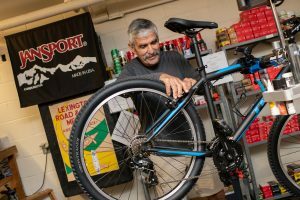 It’s a sanctuary for students of the African diaspora and their allies to foster community, friendships and activism, and a game-changer for the W&L campus. “We realized early on that social real estate is important,” said Tamara Futrell, dean for diversity, inclusion and student engagement, who, along with Tammi Simpson ’91, associate dean of students and David Leonard, dean of student life, was instrumental in bringing Sankofa House to fruition. Statistically, minority students don’t join the Greek system as much as their white peers, Futrell explained. The Greek system offers housing, socialization opportunities and, just as crucially, the space in which to host them. Previously, Chavis House served as the African-American social house, but it only fit a few people comfortably in its common area. Although it’s a relatively new community, the residents of Sankofa House have already fostered an intentional, “very inclusive” ambiance, according to Ramonah Gibson ’20, its community assistant (C.A.). The massive kitchen offers opportunities for parties and shared meals galore — such as the recent Sizzlin’ Soul event organized by the National Panhellenic Council, a collaborative organization of African-American fraternities and sororities. 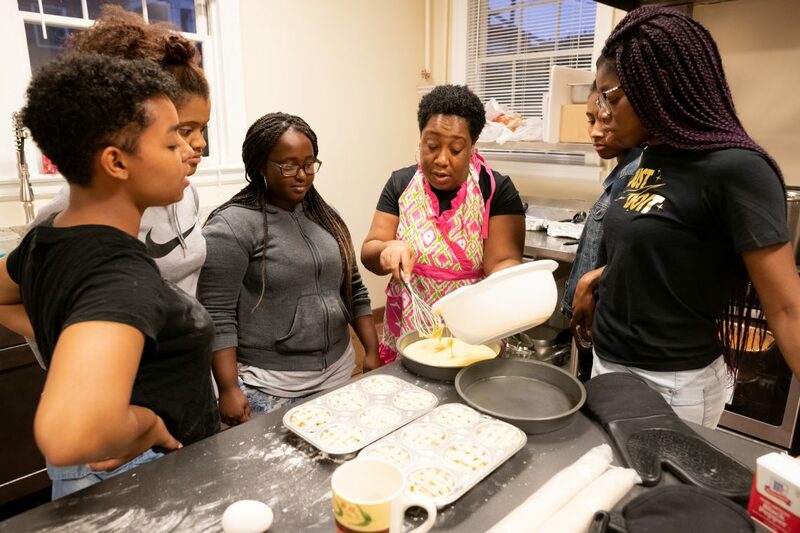 (L-R) Students MaKayla Lorick ’19, Lauryn McCray ’22, Bri Mondesir ’22, Trinity Perdue ’22 and Esther Assenso ’22 watch as Dean Tamara Futrell (center) mixes cornbread batter at Sizzlin’ Soul. After hours of cooking, talking and laughing alongside one another — students, staff and faculty alike; some who had never before tried soul food, some who had eaten it all their lives — attendees mingled over steaming plates of mac and cheese, chicken and dressing, green beans, ribs, peach cobbler, apple pie and more. It felt like a family gathering, as one attendee put it. 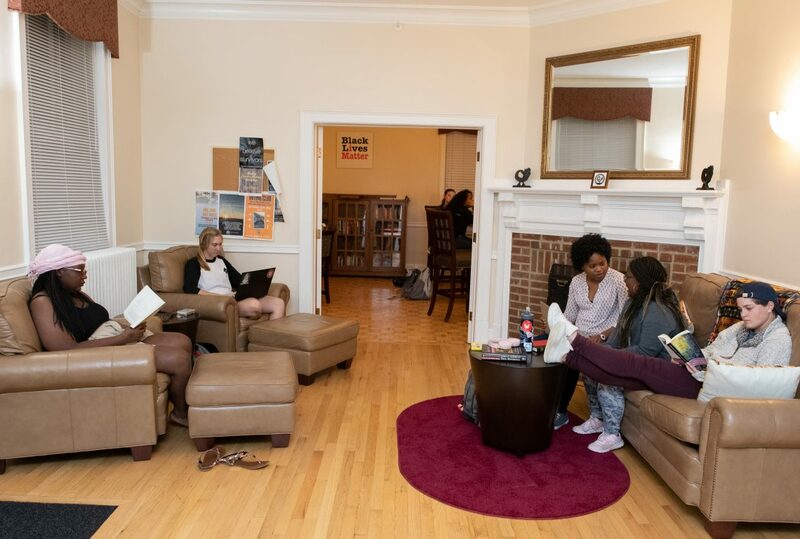 Students relax and study in one of Sankofa House’s spacious common rooms. Simpson marveled at the changes she’s witnessed since first stepping foot on campus as a freshman in 1987. She called the university “undoubtedly, demonstratively different” today, adding that hers was just the third class of women to be admitted to the previously all-male school. Futrell noted that enrollment of undergraduate American minorities at W&L increases year over year, and that black undergraduate enrollment is the highest it has been since 2012. 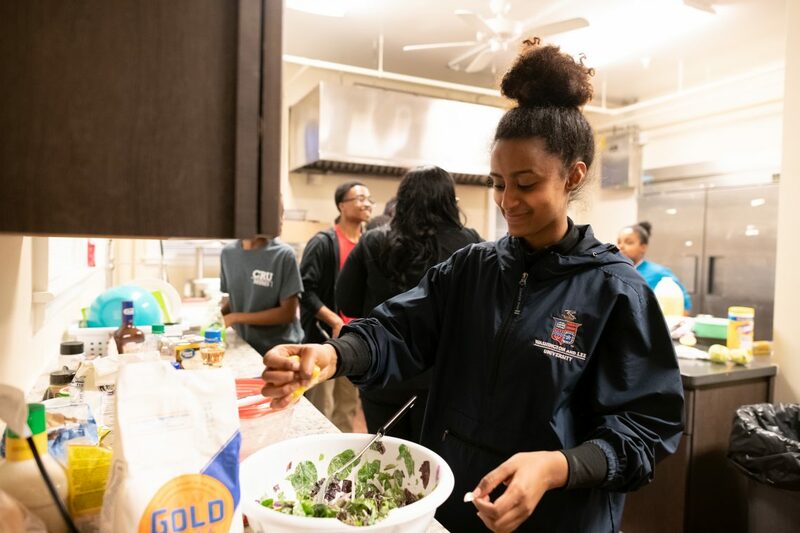 Betelihim Haile ’22 tops off a salad with a squeeze of fresh lemon at Sizzlin’ Soul. “Sankofa” is a term borrowed from the Akan people of Ghana, representative of the need to reflect on the past in order to build a successful present and future. The mythic Sankofa bird is widely seen in Akan art, as well as African-American and African Diaspora iconography. Its head is turned backwards — toward the past — its feet face forward to the future. It carries a precious egg, symbolizing knowledge, in its mouth.